Doesn’t it hurt to find out that others are criticizing you? I was pondering on this one night and decided to look in scripture at some of the many times where Jesus found Himself in the same place. Often, He saw His critics face to face while they were hurling their accusations. He was criticized for working on the Sabbath. Mt. 12:1-2, Mk. 2:23-24, Lu. 6:2,6-7, 13:10-14, Jn. 5:16. I thought that it was interesting to note that in Luke 6:2,6-7 when Jesus was criticized by the Pharisees (leaders of the church), He went on to say in that same chapter to pray for your enemies and do good to them (v. 27-28). In verse 37 He says not to judge others or to condemn others. We will often have our own critics when we make the choice to put Christ first, spouse second, and children third. Even people in the church get their priorities wrong. Some tend to think that by putting church work first that they are putting Christ first. There are many who appear to be putting church above their families, and I have seen the chaos that has come into their lives because of these erroneous actions. In Mt. 26:6-9, Mark 3:20-21, and Jn. 7:4-5, His own family criticized Him and said that He was “out of His mind.” Jesus went on to say that a prophet is without honor in his own town. (Mt. 13:54-57, Mk. 6:2-3) Many times, we will find that our those closest to us won’t understand how serious we are in our walk with the Lord. They will begin to criticize us. I have seen this in my own family, so I know how much it can hurt. Some of my family members say that I am brainwashing my daughter. That’s odd – God’s Word calls it “instructing her in righteousness.” While reading about how the people in Nazareth were furious with Jesus, driving Him out of town, and hoping to throw Him off a cliff, I saw that Jesus “walked right through the crowd and went on His way.” (Lu. 4:30) Father spoke to me and told me that as we walk His pathway, and we have critics who start talking so hatefully about us, He will enable us to also “walk right through the crowd” and go on our way. In Mt. 8:34 we see that the people asked Jesus to leave their region after setting the demoniac free. When our lifestyles show a radical change because of our Lord’s work within us, we may be asked to leave as well. It may not be said to us in those words, but we may find ourselves missing out on invitations to do things. People whom we considered friends will suddenly stop calling. Family members may act distant with you at family get-togethers. Jesus told us that if people persecuted Him, they are going to persecute us. (Jn. 15:20) In Mt. 5:11 He tells us that we are blessed when we are persecuted because of righteousness. We are told in II Tim. 3:12 that all who live godly lives will suffer persecution. I love to read the story where Mary, the sister of Lazarus, breaks open her expensive bottle of perfume and lavishly, lovingly, pours in on Jesus. This bottle of perfume is her dowry. It is very costly. To break this bottle of expensive perfume likely means that she gives up the dream that most women have — that of getting married. Back then, if you didn’t have a sizable dowry, you weren’t classified as marrying material. In spite of that, Mary chose to ‘go for broke.’ What a precious gift she gave the Lord. In ‘going for broke,’ we can gain so much because we learn to let go of ourselves. To offer something sacrificial to our Lord, it requires us to be broken of our self-centeredness and our pride. It requires us to look beyond our financial needs, looking beyond our fears for the future, and lavishing our love upon Jesus. When we are broken by God, we experience true joy because weeping endures for the night, but God promises us that joy will come in the morning. We learn that our life is in the Master’s hands, and He is carefully watching over us, using everything we face to bring about honor to His name. The brokenness we learn from our trials gains us peace that passes all understanding. Being broken helps to understand that God’s agenda is much more important than my own gives me a greater patience because I realize that I can let my own agenda go. When I’m broken to the point where I realize that I have no rights, it reduces my urge to compete with others, and that helps me to walk in kindness. In our brokenness, when God strips away our pride, we realize that within us lies no good thing, and that our heart is deceitful and desperately wicked. We learn that any goodness that comes from us is ultimately from Him. In the midst of deep brokenness, we discover that the greener grass is actually being in the center of His will, even in those times when we don’t understand His plan. This leads us to follow hard after faithfulness. We become faithful and steady even in the hardest of times. What an awesome sacrifice that is to the Lord. He knows how hard it is for us to remain faithful and steady. When we pour out our fleshly tendencies to the Lord, we realize the depths of our wretchedness. We also see the heights of God’s graciousness and goodness towards us. That works in us a gentleness in responding to those around us. God gives us all that we need pertaining to life and godliness. We have power to say NO to worldly passion. When that passion is to lose our temper, we react instead of respond to situations. Maybe the worldly passion is spending money that we don’t have, or usurping our authority over our husband. It may even be a passion to have an affair — whether that affair be physical, emotional, or even just in our mind. Breaking open that alabaster box of our flesh can bring us a self-control where we truly want what our heavenly Father wants — obedience. So many times, when we think of giving a sacrificial gift to God, like Mary did with her alabaster box, we think in terms of something that may cost us financially. We see in I Sam. 15 that to obey is better than sacrifice. Instead of trying to come up with an expensive gift to offer the Lord, why not offer up your sinful flesh? There is nothing more precious in His sight than a child who comes to offer their flesh, allowing Him to cut away those unwanted pieces so that He can make you more like Him. We may discover that sometimes obedience IS the sacrifice. Do you want to see Jesus, but at the same time, you feel like you want to hide so that He doesn’t see you? In Luke 19:1-10, we find the story of Zacchaeus, who wanted to see Jesus, so he climbed up in a sycamore tree. Notice that this wasn’t just any tree, but a sycamore tree. There are lots of leaves in a sycamore tree. Could it be that Zacchaeus wanted to see Jesus, but he didn’t want the Master to see him? But what happened? Jesus got there, and He looked up at Zacchaeus, then he called him by name. Today, if you are trying to hide from the Master, I tell you that He is calling you by name. Just as Zacchaeus had a change of heart, God wants to change YOU! And the change which He desires to bring is a change to better you and your life. Do you feel insignificant? Do you feel like your life has no meaning? Ps. 139 tells us much about how significant we are. God knows when you sit and when you stand. He knows your very thoughts. He has hemmed you in — behind and before; having laid His hand upon you. There is no place you can go where He cannot see you. He is the one who knit you together while in your mother’s womb. He saw you, even while still in the warmth and protection of her womb. Even when your body was unformed, He still saw you. If you were insignificant, why would Almighty God take the time to see you in all of these ways? YOU ARE NOT INSIGNIFICANT – YOU HAVE GREAT WORTH! Father is saying to you today, “My child, I LOVE YOU with an EVERLASTING love.” Jeremiah 29:11 tells us that God has a plan and purpose for our lives. His plan is to help us, not to harm us, to give us a hope and a future. Are you sad, to the point of weeping, and you feel so all alone? In John 11:33, we see that Jesus saw Mary weeping over the death of her brother, and He was DEEPLY MOVED. Again, in verse 38, it says that He was DEEPLY MOVED. In the depths of your pain and sadness, He has promised to never leave you, nor forsake you, (Heb. 13:5) and He is deeply moved by YOUR tears. Are you sick? I want to encourage you by telling you that the Master does see you! In John 5:6 Jesus saw the man who had been an invalid for 38 years. In John 9:1, He sees a man who was blind from birth. In Mark 10:46-52, we find the story of the blind beggar. The persistent cries of this man stopped the Master. Jesus ceased from His activity to tend the need of this one man — a man who is nameless in scripture. Jesus asked him, “What do you want me to do for you?” The man was very specific, and Jesus honored his direct request. This man teaches us three important things: 1) Be persistent in approaching the Master. 2) Be bold. This man took a bold step of faith. When he saw that he had the attention of Jesus, he threw his cloak aside. This garment is what distinguished him as a beggar. He knew that he wasn’t going to need it anymore! 3) Be specific when you pray. — I will never forget a time when I was dealing with severe moods swings from PMS. I humbled myself and went forward for prayer because I was desperate for God to touch me. The pastor was very specific in his prayer, praying that God would cause any hormonal imbalance to come back into perfect alignment, functioning the way in which God ordained it to function. I began to pray that over and over, and I found a huge difference in my moods! Praise the Lord! Now, back to Jairus. Some men approach Jairus and tell him that his daughter is dead. Jesus isn’t swayed at all by the “chatter” of these men, but simply tells Jairus not to be afraid, just believe. At this point, in verse 37, it says that Jesus didn’t let anyone follow Him and Jairus except for Peter, James, and John. Now, we know that there isn’t anything in the Word that is “insignificant.” Why do you think He did this? The rest of the people believed the word that the daughter of Jairus was dead. They accepted that as a fact, which wasn’t going to change. But our God is in the business of calling those things which aren’t as though they were! We see at the end of this story that Jesus brings Jairus’s daughter back to life. Now, when you are going through a serious illness, sometimes you need to separate yourself from “godless chatter.” You need to surround yourself with those who will believe with you, who will pray for you when you no longer know what to pray, who will pray for you when you no longer feel like praying. You need to surround yourself with those who won’t judge you, but will be willing to cry with you. You need to surround yourself with those who won’t try to tell you the solution, but are willing to BE part of the solution! You need to surround yourself with those who are just willing to love you and stand with you! Ps. 103:13-14 tells us that as a father has compassion on his children, our Lord has compassion on those who fear Him. He remembers our frame, that we are dust. So, He knows that we are going to have times when we doubt, fear, become anxious, get angry at Him over our circumstances, and more. Even though He knows this, it goes on to say in verse 17 that from everlasting to everlasting, His love is with those who fear Him. So don’t despair when you have the feelings which I mentioned. God KNOWS you are going to do this, but HE LOVES YOU ANYWAY, and HE LOVES YOU IN SPITE OF THOSE FEELINGS! Ps. 139:10 tells us that God’s right hand will hold us fast. I just learned something new about this scripture. A visual picture of this is a mother who is walking with her toddler in a parking lot. She doesn’t just hold the toddler’s hand loosely, but she firmly grasps his hand with her thumb on the outside of the hand. She has a FIRM hold on his hand. God has a FIRM hold on YOUR hand, and He is NOT going to let YOU go! God tells us in Isaiah 49:16 that He has engraved us on the palm of His hand. He could never forget you. Every time He looks at the palm of His hand, He sees YOU! When Mary and Joseph took Jesus to the temple, Mary heard Simeon say, “My eyes have seen your salvation which you have prepared for all people.” (Luke 2:30-31) She treasured this in her heart. Luke 2:8-19 tells us about the angels who appeared to the shepherds, telling them that a Savior had been born. Mary treasured this in her heart. Later, when he was only twelve years old, Jesus amazed the people when he spoke at the temple. Again, Mary treasured this in her heart. In John 2:1-11, Mary witnessed the first miracle which her son performed. The Bible isn’t clear about how many more miracles Mary was able to witness, but I would imagine that even if she didn’t see them happen, she at least heard about them. Just a few days later, Mary saw her beloved son hanging on a cross. Her chosen son, the son who was conceived by the Holy Spirit, the son who was to be a king, and he is hanging on a cross? How can this be? After all, she was there when the angel proclaimed that he would be a king. She heard the angel say that he’d sit on David’s throne and that he would reign forever. Why would God send an angel to tell her these things when it’s obvious that he can’t be a king – after all, he’s hanging on a cross! She must have been asking God why he pulled Jesus from death’s grasp when he was only two years old, only to have him die a cruel death on a cross. We all know the end of Mary’s story. We know that only three days later, her precious Son rose victorious over death, hell, and the grave. We know that He is indeed a King. Just as we know the end of Mary’s story, God knows the end of YOUR story. You may be going through a heart- wrenching experience. You can’t possibly see what good God could make of the situation. You don’t understand what He is trying to teach you, or to show you. There are times when my daughter, Rachel, wants me to explain things to her. Sometimes what she asks about are things which are just too complicated for her young mind to understand. At those times, I have to tell her I can’t give her the answer right now because she just isn’t old enough to understand. She has to trust that I know best for her. Our loving Father often chooses not to reveal things to us, as well. He sees that some things just don’t need to be explained to us. We just have to trust Him. Isaiah 55:8-9 says that God’s thoughts are not your thoughts, and His ways are not your ways. His thoughts are higher than your thoughts, and His ways are higher than your ways. Jeremiah 29:11 says that God knows the plan he has for you – plans to prosper you, not to harm you, plans to give you a hope and a future. Romans 8:28 tells us that ALL things work together for good, to those who love God and are called according to HIS purpose. Habakkuk 1:5 says that He is going to do something in your days that you wouldn’t believe, even if you were told. God is so much bigger than ANY problems which we face. He will not fail us. He will not forsake us. Be patient and wait on Him. Be still and know that He is God. I felt this title stirring in my spirit for about six weeks, but when I’d try to come up with a devotion for it, I was completely uninspired. That is because the ‘details’ weren’t there yet, ready for me to use. As I walked into church one Wednesday evening, I was approached by Elaine, who is one of the ladies in charge of our women’s ministry. She asked me if I would teach the class that night because her infant granddaughter was in the hospital with pneumonia. Her request wouldn’t have seemed that strange to me, except for the fact that in the series we were studying, I had missed more Wednesday nights than what I had attended because of my daughter having whooping cough. About the time she started getting better, I came down with it. Needless to say, I felt rather unprepared to teach! All I had with me from the previous weeks was a few notes that I had jotted down. The study we were doing wasn’t one where we took a book home to read, so there was no weekly homework to help keep me caught up each week if I was unable to attend. I felt so inadequate, but here she was, asking me to teach in her place. Now, you are probably wondering just what it was that we’d been studying. It was Improving Your Serve by Chuck Swindoll. OK, I know, some of you are seeing the humor in this already! Yes, I do believe even God got a laugh out of it! He was surely testing me to see how willing I would be to serve as a teacher that evening. Thankfully, Elaine had some great notes typed up for me to use. I was even able to thumb through the book as we quickly covered each chapter, adding a few additional tidbits of information to refresh us on what we had learned in the previous weeks. I remember reading a scripture in the Amplified Bible many years ago and it said that God is still on the throne and He still rules from heaven. It goes on to say that He closely watches everything that happens on earth. Little did I realize how true this verse would be for me that particular night when I walked into church. You see, it was a miracle that I even made it to church that evening. Just three days prior, my back went out on me. For two days, I didn’t do much but lie on the couch with the ice pack, trying to get the swelling to go down. While I was in extreme pain, I received a phone call from a dear friend, and I shared my dilemma with her. We both went to bed that night, praying that my back would heal quickly. As I talked to her the next day, I told her how much better I felt. As I began to share with her that I felt such a peace about my healing when I prayed the previous night, she quickly shared that she had the same feeling when she was praying for me. We discovered that both of us felt that God was going to bring about a very quick recovery for me. I believe that the Lord led her to call me that evening so that there would be two of us in agreement in prayer regarding my back. Even then, I still didn’t realize how much God is into details. During the time that I was afflicted in my back, God was still watching other details. He saw what was going on with Elaine’s granddaughter, and He knew Elaine was feeling torn between desperately wanting to be at the hospital, yet having a commitment to be teaching at church. At the same time, He knew that unless He touched my back, I wasn’t going to be at church on Wednesday. As I began to teach the class, I quickly discovered that one of the key scriptures in our study was Philippians 2:3. I had just studied that very scripture in depth earlier that morning as I was preparing a lesson for my Sunday school class. Because of a God who is into details, I was able to share a few of my own insights on that verse, as well as sharing what Elaine had in her notes. In Matthew 10:19, we see where Jesus tells His disciples not to worry about what to say because the Holy Spirit will be speaking through them. Our God, who is into details, allowed His Spirit to speak through me, even though I’d missed several sessions during this particular study. He has promised not to let His Word return void. (Is. 55:11) All of the countless hours that I had been diligent to pour His Word into my spirit had prepared me for a night such as this one. Even though I may not have been in attendance for nearly half of the classes, God had prepared me in advance for being a servant, ready in season and out of season. All of the work I’d put into studying, learning, applying, and obeying the Word allowed the Holy Spirit to move in and speak through me because I was already yielded. The fruit of what I’d planted the last few years was ripe and ready at a moment’s notice. Yes, I do believe that God is into details. Maybe you won’t ever be put in a situation to teach at a moment’s notice, but maybe you’ll be given a moment’s notice that you need to drop your agenda and minister to a hurting friend. Maybe you’ll receive a moment’s notice and have to immediately go to the hospital for a sick parent. Maybe you’ll be given a moment’s notice to help in the nursery when the scheduled help doesn’t show up. Maybe you’ll be asked to help serve in the kitchen during an after-church fellowship, and you don’t feel this is where God has necessarily gifted you. Whatever the situation, rest easy…your God is into details, and while you may be caught off guard, God isn’t. He’s closely watching everything that happens here on earth. I have always thought of John the Baptist as a bold man, full of spiritual strength, but we find in Mt. 11:2-3 that he sent his disciples to ask if Jesus was the one who was to come or if they should expect someone else. Even this mighty man of God had doubts. In those doubts, he questioned the Lord. In II Cor. 12:7-10 we find where Paul had been given a thorn in the flesh. He pleaded with God three times to take it away. I would imagine that he had questions of his own for God when asking for it to be removed. When God answered him by telling Paul that His grace was sufficient, Paul saw that he could delight in weaknesses, insults, hardships, persecutions, in difficulties because when Paul was weak, then his Christ made him strong. May we find that in our own weaknesses, our loving Christ can give us a strength to endure to the end. One last example is in Mt. 27:46 when our precious Savior asked of His heavenly Father, “My God, My God, why have You forsaken me?” (NIV) Even our Lord experienced a depth of loneliness that we will never have to face. He was actually separated from the loving presence of His Father. Because of that separation, we find in Rom. 8:38-39 these comforting words: “For I am convinced that neither death nor life, neither angel nor demons, neither the present nor the future, nor any powers, neither height nor depth, nor anything else in all creation, will be able to separate us from the love of God that is in Christ Jesus our Lord.” (NIV) We will NEVER face the intense despair that our Christ felt while on that cross. In those times when you have questions, go ask God. For years I was afraid to question God on anything because I heard an erroneous teaching about ever questioning God. I have learned in the last several years that God will often answer my questions. Maybe it’s not the answer that I was looking for, but His answer always brings clarity and/or peace of mind to me. I have learned to go boldly to His throne because I have a high priest who is able to sympathize with me in my weakness and in my questions because He even had a question of His own when He was bearing the weight of my sin. Heb. 4:14-16. I remember a story about a wonderful saint in our church who has gone on to be with Jesus. Everyone in the church called her “Grandma Rose.” One day, someone asked her a question. She paused to think upon the question, then she said, “Go ask God!” What wisdom Grandma Rose possessed! Too many of us would come up with some kind of answer, even if it were the WRONG answer. Grandma Rose was wise enough to admit that even she didn’t have all the answers, and when she didn’t know the answer, she knew Who would have the answer! Moses had a lot of questions for God. In Ex. 3:13 he was asking God what he should tell the Israelites that His name was. In the next verse, God told him to tell them that “I AM has sent me to you.” When God told Moses that he was going to be God’s spokesman to people, Moses came back with these reasons of why he couldn’t possibly be the servant to speak to the Israelites. In other words, he was questioning God’s wisdom in choosing him. – How many times have we made excuses for not doing what God was clearly telling us to do? Once Moses spoke to Pharaoh and told him to let the people go, the workload of the Israelites drastically increased. Moses approaches God in Ex. 5:22-23 asking Him why He had brought this trouble upon the people. – I can picture Moses whining in this particular question. How many times do we go whining to God? In spite of this, as you read through the life of Moses, you can see that God used him mightily to fulfill His desire for the Israelites. God can even use us in spite of our own whining! In Ex. 15:24, the people are grumbling to Moses about the bitter waters at Marah. Moses cries out to God. God told him to throw wood in the water (wood representing Christ), making the bitter waters sweet. In Ex. 32:9-10 God calls the Israelites a stiff-necked people, and He is ready to destroy them. 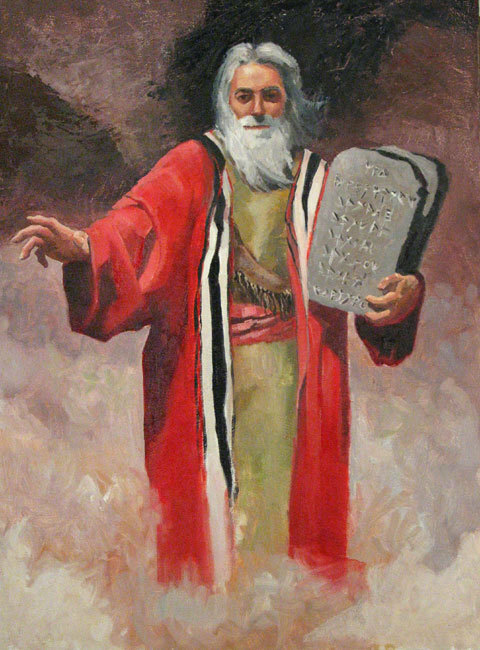 Moses asks God another question, seeking God’s favor for the people. He reminds God of His promise to Abraham, Isaac, and Jacob. Because of this, God relented and did not destroy the people. Maybe YOUR intercession on behalf of some people could cause God to change His mind on what He is going to allow into their lives. In Ex. 33:16, Moses says, “What else will distinguish me and your people from all other people on the face of the earth?” (NIV) God answers him by telling him that He will go with them. He also tells Moses that He is pleased with him and knows him by name. – Let me remind you that God knows you by name. Even on those days when you feel utter despair creeping in, He still knows you by name, and His presence goes with you, just as His presence went with the Israelites. In spite of the many questions that Moses had for God, God didn’t give up on Moses. In fact, they had an awesome and intimate relationship. When Moses died in Deut. 34:5-6, God was the one to bury him. In verse 10 of that same chapter, we see that there was never another prophet in Israel whom the Lord knew face to face. Sometimes I think we fear going to God and asking Him any of our questions. God is a loving, gracious, and compassionate God. We don’t need to fear asking Him questions. It doesn’t mean that we will get the answer for every question we have, but we just might get some answers that give us very clear insight. Is II Sam. 5:19, we find David asking God if he should go and attack the Philistines. – How often do we think to ask Father God if we should go do “this or that?” Too many times, we just make our plans and ask God to bless them, without waiting to see if that is even His plan for us. In II Sam. 12:16, we find David pleading for the life of the child who was conceived in his adultery with Bathsheba. I can imagine him asking God many questions during the time that he was pleading and fasting on behalf of the child. In spite of not receiving the answer that he so diligently sought, we find that David cleaned up, then went to the house of the Lord and worshiped. – Many times we may not receive the answers that we want. We need to remember that God’s ways are higher than our ways, and that His thoughts are higher than our thoughts. (Is. 55:8) Even if the answer isn’t what we may have desired, we need to remember that God always has our best interest at heart. I have seen the above happen in my own life when I miscarried my first child. Although after eight years, I still have times when I am so saddened by the loss, and feel the emptiness, I can now say that I wouldn’t trade that experience for anything in this world. I have learned too much about my God through it. I have come to intimately know Him as my Comforter and my Shield. I have seen Him as the Healer of Broken Hearts. I have seen Him take my hard heart and soften it to be responsive to the pain and despair others are feeling.